Etched glass is an excellent way to provide both beauty and privacy. 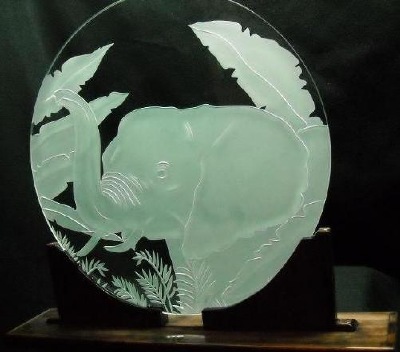 We etch glass by the process of sandblasting. Use etched glass to divide dining from living areas, it separates an area without isolating it. Other applications include entryways, shower doors, hot tub enclosures, bathroom windows, glass doors, tabletops, mirrors, kitchen cabinets, even car windows. Etched art on sliding glass doors is an elegant way to prevent an accidental walk-through, while enhancing the view beyond the glass. Where a window looks out on a less-than-appealing- view, etched glass can turn an eyesore into a centerpiece. If you need to bring daylight into a room, consider sandblasted glass, as it produces a soft, white glow. The tiny pits blasted into the glass refract and diffuse the light, producing brilliant, glare free illumination.